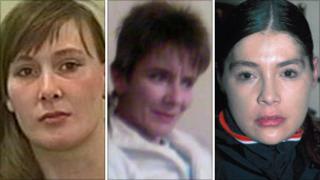 The mother of a woman murdered by Bradford serial killer Stephen Griffiths has urged him to reveal where her body is. Griffiths has been told he will spend the rest of his life in prison for the murders of Suzanne Blamires, Shelley Armitage and Susan Rushworth. Ms Rushworth, 43, was last seen in June 2009. She bled in Griffiths's flat but her body has never been found. In a statement, her mother said she wanted to be able to put her to rest. Christine Thompson said: "Susan went missing more than 12 months ago and as a family we still don't know where she is. "As a family we have not been able to put our daughter to rest because she has not been found, so we want to appeal to this man to tell us what he has done with Susan." Mrs Thompson said her daughter's father, Barry, had died a month after she disappeared. "His final words were to ask for Susan and what grieves the family most of all is that Griffiths took away the opportunity for him to speak to her before he died." Suzanne Blamires's mother said her daughter had been "deeply loved and her death has left a huge hole in our lives". "This will be the first Christmas we have spent without Suzanne in 36 years and I know I will never get overher loss," she said. "Quite simply no family deserves what we have gone through. All of these girls were people's daughters and much-loved human beings." Ms Armitage's mother Gill said: "Our daughter Shelley was very much loved and will be very sadly missed by us all. "Unfortunately she took the wrong path at the young age of 16 years old, when she became a victim of heroin. "Her death will haunt us for the rest of our lives." Each of the women thanked West Yorkshire police for their work and support throughout the investigation. Assistant Chief Constable Jawaid Akhtar in turn paid tribute to each of the victim's families. He said they acted with "dignity and understanding throughout what must have been a difficult time for them". "Nothing can compensate the relatives of the three women whose lives were cut short, but hopefully seeing Griffiths convicted and sentenced today has brought them some comfort."